Paul Mitchell Schools will kick off their 13th annual FUNraising campaign on March 1, 2016, with a goal of raising $2.5 million for nine major charities and dozens of local nonprofits. Last year, Paul Mitchell Schools raised $1.7 million, bringing their 12-year total to over $15.2 million. They proudly report that the cost incurred in raising the $15.2 million has been less than 4%, an amazingly low amount compared to the national average of 25%. Last year, Paul Mitchell Schools raised $1.7 million, bringing their 12-year total to over $15.2 million. They proudly report that the cost incurred in raising the $15.2 million has been less than 4%, an amazingly low amount compared to the national average of 25%. 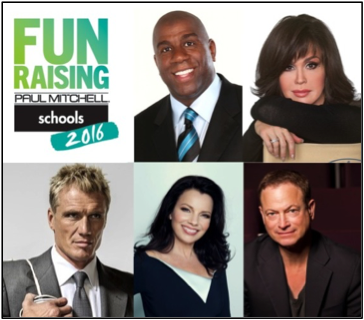 All Paul Mitchell School leaders will conclude the FUNraising campaign with a four-day training featuring guest speakers Magic Johnson and beauty industry icon Sam Brocato. The annual FUNraising Gala, the highlight of the annual campaign, takes place on May 15, 2016, at the Beverly Hilton in Beverly Hills, California. The event celebrates all of the participating schools while raising additional money. For tickets and additional details, visit www.paulmitchellschoolsfunraising.org. At Paul Mitchell Schools, we believe that education is an adventure and the learning experience needs to be fun and well rounded. Our courses focus on important technical skills and business knowledge with an emphasis on social and community responsibility. Our learning leaders are trained to draw out the artist in our students and prepare them to enter their chosen careers as community-conscious salon and spa professionals. Through our annual “FUNraising” campaign, we’ve raised and donated over $15.2 million in support of many charitable causes. We’ve built homes with Habitat for Humanity, fed thousands of African orphans, and supported the victims of AIDS, breast cancer, homelessness, abuse, and hundreds of other causes. Established over 35 years ago, the Paul Mitchell network is nearly 100,000 salons strong and in 81 countries worldwide; every professional hairdresser knows the Paul Mitchell name. Now, with the arrival of Paul Mitchell Schools, we’ve taken the world of cosmetology education by storm! Visit www.paulmitchell.edu to learn more. Andrew Gomez Dream Foundation was founded to honor a successful Paul Mitchell School graduate whose struggle against mental illness ended tragically in suicide. The foundation helps cosmetology students, graduates, their families, and cosmetology-related enterprises. Funds have provided educational opportunities, hurricane relief, and support in the fights against breast cancer, domestic violence, and other destroyers of self-esteem. Children’s Miracle Network Hospitals (CMN Hospitals) raises funds for 170 children’s hospitals across the United States and Canada, which, in turn, use the money where it’s needed the most. Since 1983, Children’s Miracle Network Hospitals has raised more than $5 billion, most of it $1 at a time, all in support of the mission to save and improve the lives of as many sick and injured children as possible. Whether building custom Smart Homes for severely wounded heroes, hosting festivals at military hospitals, or supporting families during times of urgent need, the Gary Sinise Foundation is dedicated to serving and honoring America’s defenders. Magic Johnson Foundation supports educational empowerment through HIV/AIDS awareness, college access, and digital literacy. No Limits is the only program in the world that teaches low-income deaf children the skills to succeed in school and in life through its national theater program and after-school educational centers that enhance their confidence and communication skills while providing the leadership and academic skills to be college ready. No Limits educates parents to be advocates for their deaf children and shows that they have the potential to go farther than they can imagine. Thirst Project is the world’s leading youth water activism organization. In just six years, Thirst Project has mobilized more than 300,000 students and young people who have raised over $8 million, 100% of which has been used to build freshwater wells in 12 countries, giving more than 260,000 people safe, clean water.